Clinically supported, indication-specific probiotic formulation for reduction of depressive sensitivity. 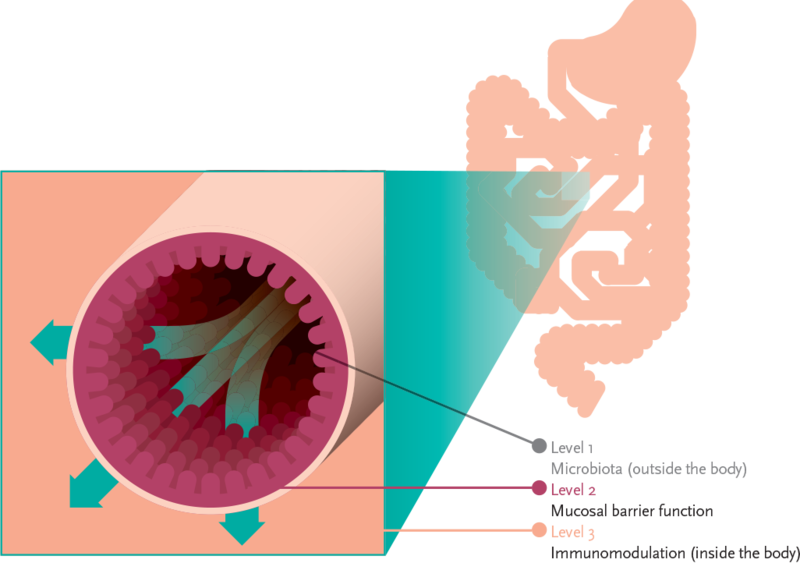 Figure 1: Ecologic® BARRIER is a multispecies probiotic developed to strengthen the intestinal barrier function and decrease inflammation. Ecologic® BARRIER is a multispecies probiotic formulation. The bacterial strains have been selected for their capacity to strengthen the intestinal barrier and reduce low grade inflammation1 (figure 1). Mental disorders, depression in particular, are becoming a global epidemic. Worldwide, more than 350 million people of all ages suffer from depression.2 A variety of lifestyle and environmental changes may be responsible for the increased prevalence of mental disorders. One specific area of interest is the relationship between the intestinal microbiota and mental health (figure 1). 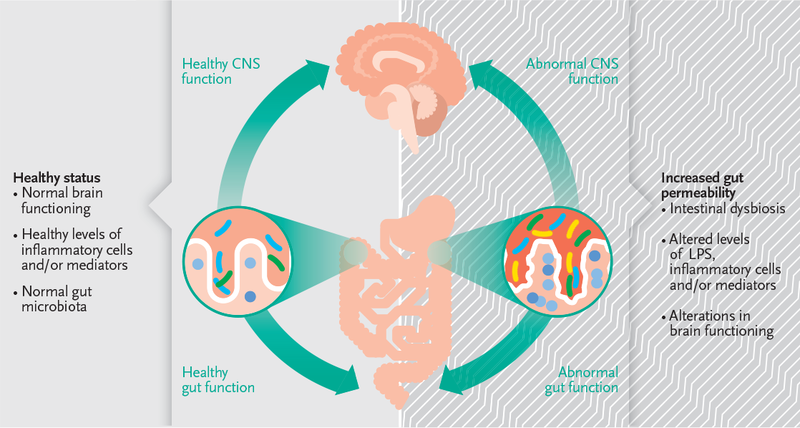 The intestinal barrier appears to play an important role in the communication between the gut and the brain. Impaired barrier function negatively influences hormones, immune cells and bacterial metabolites that affect the gut-brain axis. Two studies with Ecologic® BARRIER have been performed related to depression both indicating a positive effect. In the first study, performed at Aarhus University, Denmark, healthy rats were given Ecologic® BARRIER or placebo for 8 weeks. After this period the animals performed a forced swim test, a typical screening for depressive-like behavior in rodents. The more depressed rats are, the less they move. Figure 3: Seconds of immobility during the Forced Swim Test. The more depressed rats are, the less they move. *Significant decrease. 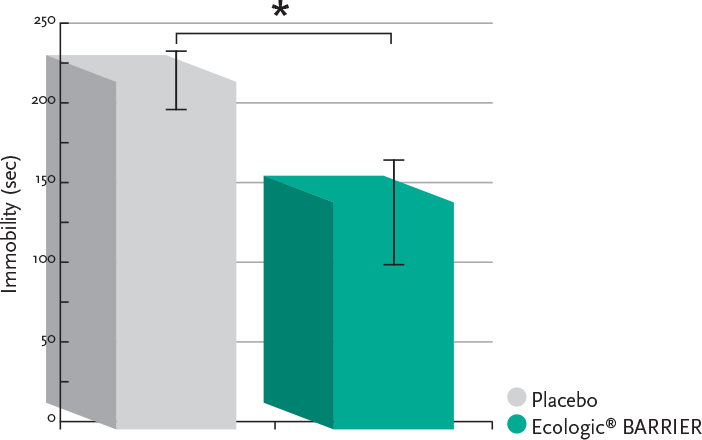 The group of animals that consumed Ecologic® Barrier moved significantly more compared to the placebo group9 (figure 3). In the second study, a randomized, placebo- controlled human trial performed at Leiden University, the Netherlands, 40 students were given Ecologic® Barrier or placebo for 4 weeks. Before and after the intervention a validated questionnaire, the Leiden Index of Depression Sensitivity that measures cognitive reactivity in response to sad mood, was filled out. At baseline there were no differences between the two groups, but after 4 weeks the sensitivity to depression score was significantly decreased in the Ecologic® Barrier group compared to the placebo group (figure 4). The most pronounced decreases were found in the categories aggression and rumination.11 These positive results have led to a follow-up study in an elderly population. Multiple studies are currently planned or ongoing that further investigate the effect of Ecologic® BARRIER on a variety of mental disorders in diverse populations. The results indicate that supplementation with Ecologic® Barrier can influence the gut-brain axis and contribute to alleviating mental distress. Figure 4: Scores on the Leiden Index of Depression Sensitivity (LEIDS-r) before and after 4 weeks use of Ecologic® BARRIER. *Significant decrease, P<0,001. van Hemert et al. Influence of the multispecies Probiotic Ecologic ® BARRIER on parameters of intestinal barrier function. Food and Nutrition Sciences 2014. Abildgaard et al. Probiotic treatment alters behavior in rats on standard and high fat diet. Acta Neuropsychiatrica 2014;26:1 (abstract). Steenbergen et al. A randomized controlled trial to test the effect of multispecies probiotics on cognitive reactivity to sad mood. Brain Behav Immun 2015;48:258-64. 1. van Hemert et al. Influence of the multispecies Probiotic Ecologic® BARRIER on parameters of intestinal barrier function. Food and Nutrition Sciences 2014. 2. WHO, factsheet N369, October 2012. 3. Cho et al. The human microbe: at the interface of health and disease. Nat Rev Genet 2012;13:260-270. 4. Cryan et al. Mind-altering micro organisms: the impact of the gut microbiota on brain and behavior. Nat Rev Neurosci 2012;13:701-712. 5. Chen et al. The role of gut microbiota in the gut-brain axis: current challenges and perspectives. Protein Cell 2013;4(6):403-14. 6. Dinan et al. Melancholic microbes; a link between gut microbiota and depression? Neuro gastro enterol Motil 2013; 25: 713-719. 7. Borre et al. Microbiota and neuro developmental windows: implications for brain disorders. Tr in mol med 2014;20(9):509-18. 8. Collins et al. The interplay between the intestinal microbiota and the brain. Nature Reviews Microbiolog 2012; 10: 735-742. 9. Abildgaard et al. Probiotic treatment alters behavior in rats on standard and high fat diet. Acta Neuropsychiatrica 2014;26:1 (abstract). 11. Steenbergen et al. A randomized controlled trial to test the effect of multispecies probiotics on cognitive reactivity to sad mood. Brain Behav Immun 2015;48:258-64.